A man flies the French tricolor flag over crowds marching to the Arc de Triomphe during the Paris students' strike. Students and police facing each other in a Paris street during the student riots. Workers from the Nanterre Citroen car factory take part in the demonstration organized by the CGT French workers union on May 29, 1968. 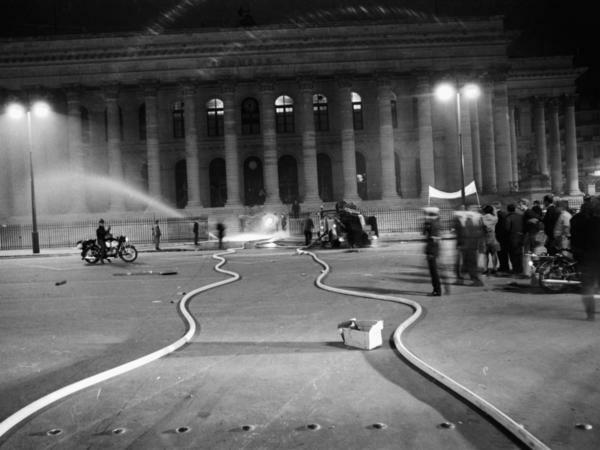 The Paris Bourse, the stock exchange building, was attacked by protesters on May 25, 1968. President Charles de Gaulle of France delivered his speech to the French nation on television in Paris, May 24, 1968. 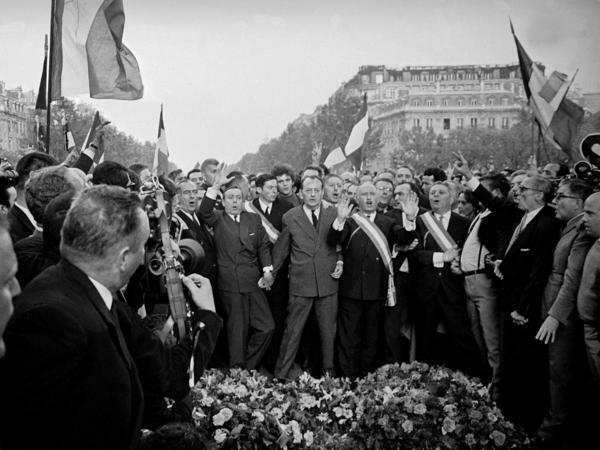 Hundreds of thousands of people, including finance minister Michel Debre and culture minister Andre Malraux (center, holding hands) demonstrated in support of President Charles de Gaulle on May 30. "Everything was patriarchal, starting in the family, where you couldn't speak at the dinner table unless spoken to," says Josette Preud'homme, who took part in the 1968 protests as a 20-year-old and says it changed her life. "You couldn't go out with friends, and never with boys. Everything was forbidden everywhere. You had to obey orders in the factories, in the schools. We were suffocating. There was this enormous need to talk and share. Everyone was fed up." 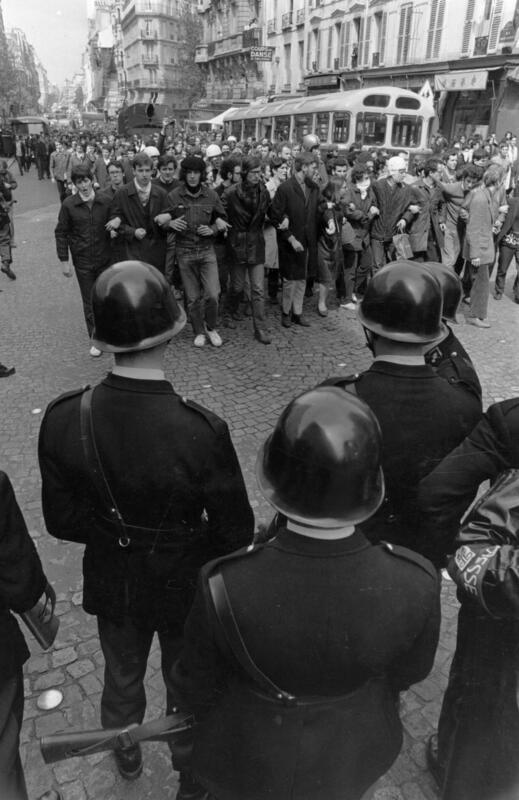 Events that led directly to the revolt of May 1968 began in March on the campus of the University of Paris at Nanterre, on the far western edge of the city. The children of mostly bourgeois Parisians did not have sophisticated political demands. Their spontaneous occupation of some of the administration buildings was partly a demonstration against the Vietnam War, and partly to demand something closer to home: to be able to spend the night in each other's dorm rooms. Several students were arrested and the university was temporarily closed. On May 3, students at the Sorbonne University in Paris rallied to support their Nanterre colleagues by occupying an amphitheater. They were brutally dispersed by Paris police. Hundreds were beaten and 400 arrested in a night of rioting. The Sorbonne was closed. In the days that followed, more students arrived to hold larger demonstrations. They dug up Paris' cobblestone streets and hurled the rocks at police, who responded with tear gas and batons. 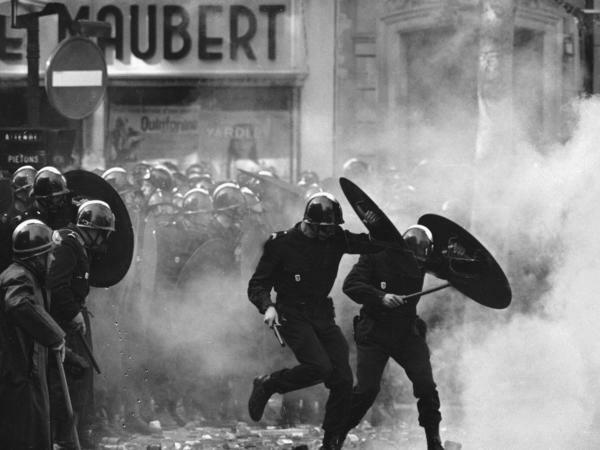 Today in France, the events of May 1968 have taken on romantic, mythic proportions. On the 50th anniversary this month, magazines and exhibitions are devoted to it, and documentaries and conferences are analyzing and re-analyzing it. May 1968 encompassed a cultural revolution, even a sexual revolution, before a political one. And in no other country did a student rebellion lead to a workers' revolt that nearly brought down a government. The events of May 1968 can still divide the French. Conservatives like former President Nicolas Sarkozy charge the events of that year degraded public morals and respect for authority. For those on the left, it brought much-needed progress but didn't go far enough. During the upheaval, Paris' Latin Quarter became a battlefield. Students built more than 600 barricades by uprooting trees, street signs and sidewalk grates. Cars were overturned. The French were shocked by the police brutality. Jean-Luc Hees, a journalist and author of Le Roman de Mai 1968, was 16 that year, living in a small village in Normandy. "When you fight in the streets, something happens," he says. "People got the news and it was really impressive to watch – the pictures. It looked like civil war, in fact. So people started to really think about it. And they were expecting something that they couldn't quite put words to." As the student protests spread, he says, "there was an excitement and the feeling that something might be about to change." Cities became the hubs of student gatherings and lively intellectual debates. Paris was awash in idealistic posters and slogans: "Life, quickly!" "Be realistic – demand the impossible." And, as the dislodged cobblestones revealed a layer of sand: "Under the paving stones, the beach!" On May 13, workers at a Renault car plant and other factories walked off the job to join the students. Soon 10 million workers were out of work and had joined the protest movement. Factories closed or were occupied by workers. There was no gasoline, no trains, no mail delivery. Economic life in France ground to a halt. While the blue-collar workers' lives and demands had nothing to do with the students', they saw hope for change in their movement. The workers' demands included better working conditions, higher salaries, earlier retirement and union representatives within the factories. Because television was state-owned, the government censored coverage of the violent demonstrations. But private and other radio networks continued to bring live reports to millions of French people. Christian Brincourt was a young reporter with Luxembourg's RTL on the barricades. He says even though the government tried to block transmission, they were still able to report live from the scene. "We went to the people living on the second-floor apartments, who were following this day and night," he says. "And they wanted to help us. We pulled their phone lines out on the balconies and hooked up our radio equipment and continued to broadcast live, thanks to the state telecom. That made the government furious!" There are echoes of 1968 in what's been happening this May in France. Students are again occupying universities, this time to protest President Emmanuel Macron's plans to introduce a selection process for college admission. And train workers are in the streets, protesting Macron's overhaul of the state rail company. At a recent student occupation at Nanterre University, several train conductors showed up to give their support. "Today's work world is completely different from May 1968," says Philippe Martinez, the head of France's General Confederation of Labor. "Back then, there were fewer unemployed and not as many precarious jobs. And we didn't have Uber, of course. But the struggle is the same. And there's no reason we can't come together with the students like we did in 1968." But during the events of May 1968, the government was paralyzed. De Gaulle — who had been the country's moral leader and commander of the Free French forces fighting Germany in World War II — didn't take the students seriously until it was too late, historian and biographer Jean Lacouture said in a 2017 documentary. "General de Gaulle was a man of power who imposed his authority throughout history," said Lacouture. With students demonstrating in favor of greater social and sexual freedoms, "here he is facing a kind of comic tragedy, a false tragedy, and he doesn't know how to react." On May 29, de Gaulle disappeared. For a brief moment, it looked as if he'd fled the country and the students had won. As it turned out, he had gone to consult one of his generals at a French military base in Germany. Even today, it's unclear exactly what happened, but de Gaulle returned and addressed the nation on the radio the next day. He told the French he would not resign, back down or change prime ministers. But he said he would dissolve parliament and call new elections. 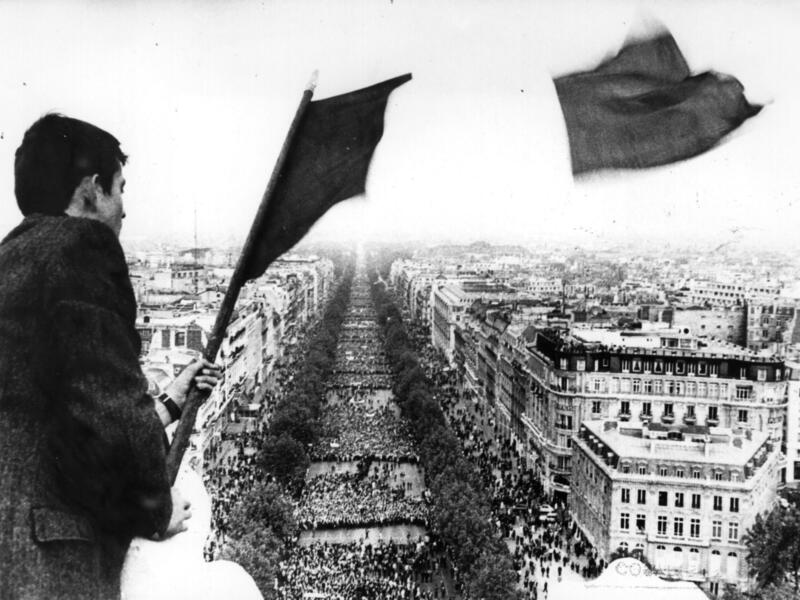 The next day, nearly a million de Gaulle supporters marched up the Champs Elysees calling for an end to the anarchy. And with that, May 1968 came to an end. De Gaulle's Union for the New Republic party overwhelmingly won parliamentary elections in June. But he resigned, as promised, the following April, after losing a referendum that he called in hopes of reinforcing his legitimacy and leadership. 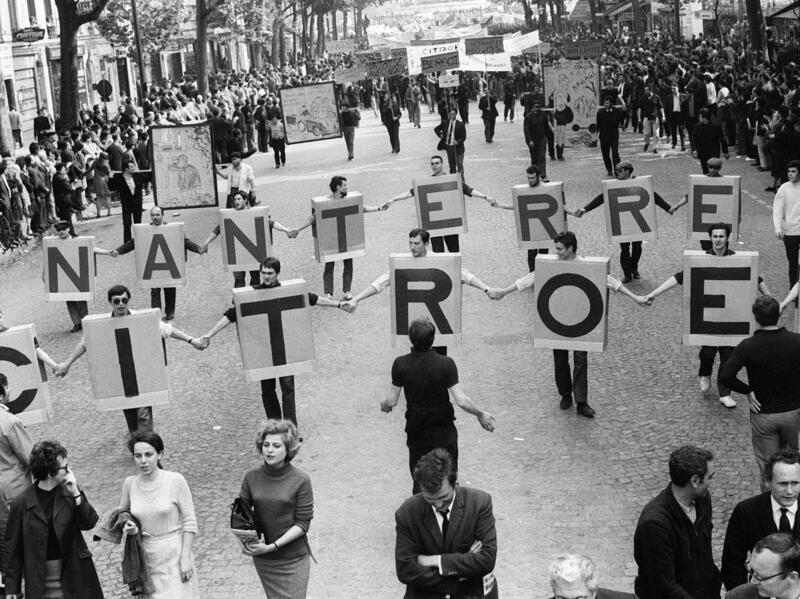 Many in France say nothing formally changed after May 1968. Some of the major student activists on the barricades are now politicians, prominent journalists and other members of the French establishment. But in other ways, nothing would be the same again. May 1968 ushered in both the women's movement and the sexual revolution in France. Workers got higher salaries, better working conditions and stronger unions in response to their protest demands. The students' demands were diffuse — more philosophical than political. Fifty years on, polls show that most French people say May 1968 was a good thing — a brief moment when everything seemed possible. This year we have been reflecting back on the upheaval of the year 1968, and this morning our series shifts to France. Fifty years ago this month, that country was paralyzed when striking students and workers joined forces and almost brought down the government of President Charles de Gaulle. That moment was short-lived, but, as NPR's Eleanor Beardsley reports, May 1968 still reverberates deeply in France today. ELEANOR BEARDSLEY, BYLINE: Just weeks before the events of May 1968 began, a journalist from the newspaper Le Monde claimed the French were too bored to take part in the upheaval that was sweeping other countries. There was peace and prosperity in France and apparently nothing that would bring people out into the streets. But there was an entrenched patriarchal society led by a deeply conservative President Charles de Gaulle, who had been in power 10 years with no change in sight. On top of that, there was a generation of baby boomers yearning for freedom. Josette Preud'homme was 20 years old at the time. She says May 1968 changed her life. JOSETTE PREUD'HOMME: (Through interpreter) Everything was patriarchal. It started in the family, where you couldn't speak at the dinner table unless spoken to. You couldn't go out with friends. Everything was forbidden, everywhere. You had to obey orders in the factories, in the schools. We were suffocating. BEARDSLEY: The movement began in earnest on May 3, when a minor student protest at the Sorbonne University in Paris was brutally dispersed by the police. Hundreds were beaten and 400 arrested in what turned into a night of rioting. The Sorbonne was then closed, but more students arrived in the following days to hold larger and larger protests. They dug up Paris's cobblestone streets and hurled the rocks at police, who responded with tear gas and billy clubs. BEARDSLEY: There were protests every day and riots every night. Paris's Latin Quarter became a battlefield as students built more than 600 makeshift barricades. Many people were shocked by the brutality of the police. Journalist Jean-Luc Hees wrote a book about May '68. Though he was 16 and living in a small town in Normandy, he says the whole country was affected. JEAN-LUC HEES: When you fight in the streets, something happens. You know, people get the news. And it was really impressive to watch the pictures of it. It looked like a civil war, in fact. So people stopped to think about it, and people were expecting something that they couldn't put names on it. BEARDSLEY: As the student protests spread to cities around France, there was an excitement and a sense that things might be about to change, says Hees. BEARDSLEY: Soon workers began joining the students, and by mid-May, 10 million workers had walked off the job. Factories closed or were occupied. There was no gasoline, no trains, no mail delivery. France ground to a halt. The government was paralyzed. UNIDENTIFIED RADIO ANNOUNCER: (Speaking French). BEARDSLEY: Even though the state-controlled radio and TV censored the news, private radio networks brought live coverage to millions of French people. Christian Brincourt was a young reporter on the barricades. He says even though the government tried to block transmission from their radio cars, they were still able to report live from the scene. CHRISTIAN BRINCOURT: (Through interpreter) We went to the people living on the second-floor apartments who were following this day and night, and they wanted to help us. We pulled their phone lines out on the balconies and hooked up our equipment and continued to broadcast live, thanks to the state telecom. That made the government furious. BEARDSLEY: Today, May '68 has taken on romantic, mythic proportions in France. On this 50th anniversary, there are magazines and exhibitions devoted to it. It's being analyzed and reanalyzed in documentaries and conferences. But May '68 can still divide the French. Conservatives like former President Nicolas Sarkozy charge the events of that year degraded public morals and respect for authority. For those on the left, it brought much needed progress but didn't go far enough. BEARDSLEY: There are even echoes of 1968 in what's happening this May in France. Students are again occupying some universities, this time to protest President Emmanuel Macron's plans to introduce a selection process to getting into college. And train workers are in the streets protesting Macron's overhaul of the state rail company. BEARDSLEY: At a recent student occupation at Nanterre University, several train conductors showed up to give their support. Philippe Martinez is the head of the CGT union. PHILIPPE MARTINEZ: (Through interpreter) Today's work world is completely different from May 1968. Back then there were fewer unemployed and not as many precarious jobs, and there was no Uber, of course. But the struggle was the same, and there's no reason we can't come together with the students like we did in 1968. BEARDSLEY: The events of May '68 ended as suddenly as they began. Unable to quell the crisis, on May 29, President De Gaulle disappeared. For a few hours, it looked as if he'd fled the country and the students had won. Even today, it's unclear exactly what happened. 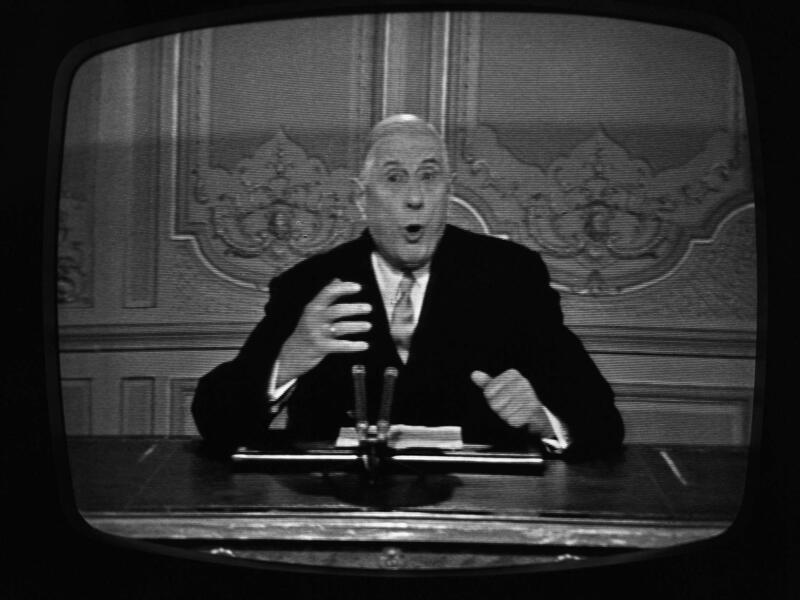 But De Gaulle returned and the next day addressed the nation on the radio. CHARLES DE GAULLE: (Speaking French). BEARDSLEY: He told the French he would not resign, back down or change prime ministers. But he said he would dissolve parliament and call new elections. BEARDSLEY: The next day, nearly a million De Gaulle supporters marched up the Champs-Elysees calling for an end to the anarchy. And with that, May '68 came to an end. De Gaulle's party overwhelmingly won parliamentary elections in June, but he had to resign the following April after losing a referendum. Many say nothing formally changed after May 1968. The students on the barricades are now members of the establishment. But in other ways, nothing would ever be the same again. May '68 ushered in the women's movement and the sexual revolution in France. Fifty years on, polls show that most French people think May '68 was a good thing, a brief moment when everything seemed possible. Eleanor Beardsley, NPR News, Paris. CLAUDE NOUGARO: (Singing in French). Transcript provided by NPR, Copyright NPR.